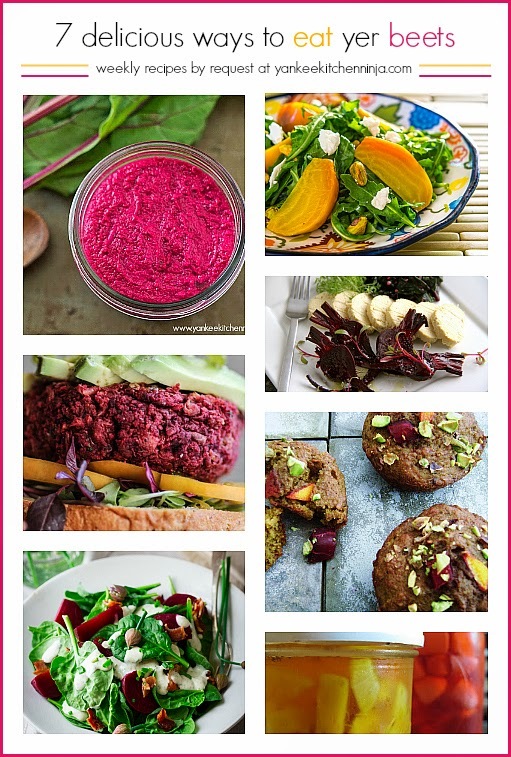 Seven unique and delicious recipes for gorgeous summer beets: enjoy them roasted, pickled or even baked into muffins! Hey now -- welcome to Week 6 of the CSA Share Ninja Rescue for 2014. You know the drill: You tell me each week what produce from your CSA share (or garden or farmers' market) is giving you fits, and I talk you down from the ledge with a list of delicious, healthy recipes on Tuesdays. For Week 6, we're talkin' beets. Love me some beets! They are especially delicious roasted but I'm partial to pickling them as well. But have you also considered them for salads? How about burgers? And, best yet, beet muffins? Behold: Seven unique and delicious recipes for eating gorgeous beets -- all from me and my favorite fellow food bloggers. No beets in your box? No biggie: There are a ton of other recipe suggestions from the past three years of the CSA Share Ninja Rescue for whatever other produce you do have right now. Don't forget to suggest some produce in the comments below. The Rescue will be on hiatus next Tuesday so The Ninj can enjoy a long July 4th holiday weekend, but I'll feature your veg in the next roundup! Don't forget beet kvass! I've got a batch burbling right now! Super cool! That beet pesto looks awesome! I looooove beets! I just like them roasted with EVOO and sea salt. Candy! Mmmm!